Today marks the anniversary of Ralph Sappington’s death. I think of Ralph often, especially since I started attending Rocky Mountain College two and a half years ago where he was the jazz band director (among other things) prior to my arrival. Our relationship all started when Ralph heard me play with a group called Four or More at the Lion’s Den when it was in West Park Plaza and you could smoke in bars (probably 8 or 9 years ago). He saw some sort of potential and had me play for a student’s senior recital and then a gig with him at Walkers with Bill Honaker and Jeff Troxel. 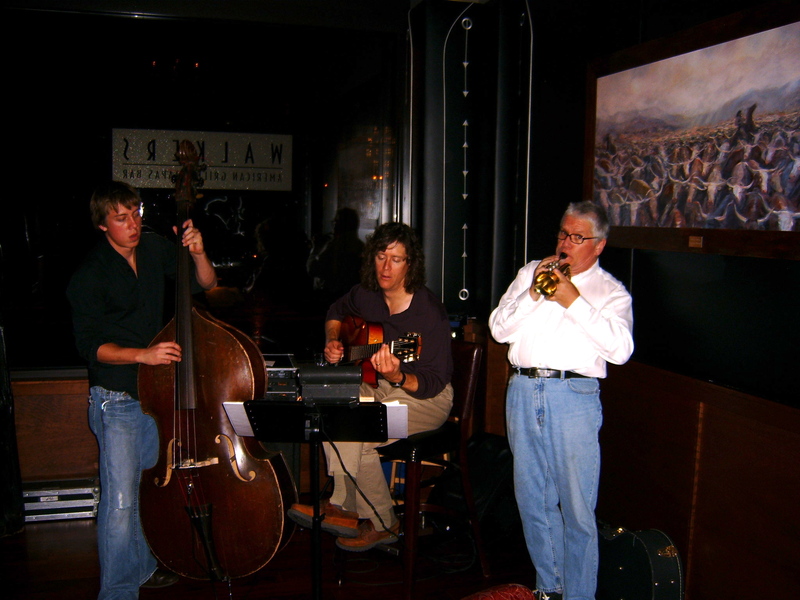 This was my first gig at Walkers and my first time getting to meeting some different players around town that I’d heard about and I was freaked out; the guys that played at Walkers were the real deal (they still are). It was also a catalyst for me to know almost every musician in town that I know now. It was a good gig (I think) and we continued to work together off and on. Off only because I decided that I did not want to be a bass player and I was going to focus on guitar–taking many unnecessary years off from playing and studying the instrument in hopes to be the next Nels Cline meets Robben Ford guitar star. I know, silly…absolutely silly. One time I was booked to play with Ralph at his main hang Rock Creek Roasters. I double booked myself and called him and left a message that I wouldn’t be able to do the gig because I was due to play a really big gig with my main band. I left a message and had a weird feeling about it and that feeling was that the message didn’t get received. Being the lazy optimist that I am, I figured I shouldn’t double check, that way avoiding any conflict and I could go about my aloofness. A couple days before the gig he called me, I remember I was in Target, and he was confirming me on the gig. My heart stopped when I saw his number and knew that my premonition months before was not a joke. I told him that I had left him a message and explained my situation. He was surprisingly gracious even though I projected he was steaming at my idiocy and inconvenience, he told me he would find a sub and we hung up. A few days later, and I was waiting for it let me tell you, he called and asked to pick up the bass he was loaning me to practice on. I dropped it off and apologized and that was that. He called me back that night looking for the endpin and I swore up and down that I didn’t have it and he said he would look again and call me back. He called me back and I was a real jerk, because I felt guilty for missing the gig and I thought he was really mad at me, I was projecting all of this mind you, and we hung up. About two days later I found the damn endpin in my house. I sulked over to his apartment and gave it to him. That would be the last time in a long time that I would play with Ralph. Fortunately we played on a gig and had a real good talk. I never got the chance to apologize for my childish and irresponsible behavior but we did talk about our mutual love for Ricki Lee Jones and Tom Waits, so I think in the music world we patched things up, at least I did, I don’t think Ralph had any patching to do. Ralph passed away unexpectedly soon after that. It was and still is a shock when I think about it. He was a kind man and there is a part of his encouragement that sticks with me today and most days. Before the “incident” he was suggesting that I move to L.A. and study with Bob Magnusson. Also, I don’t know how it played out but “Ralph’s” bass (a 40’s blonde Kay) was left in my care after he passed away. That bass is the reason that I play bass now. 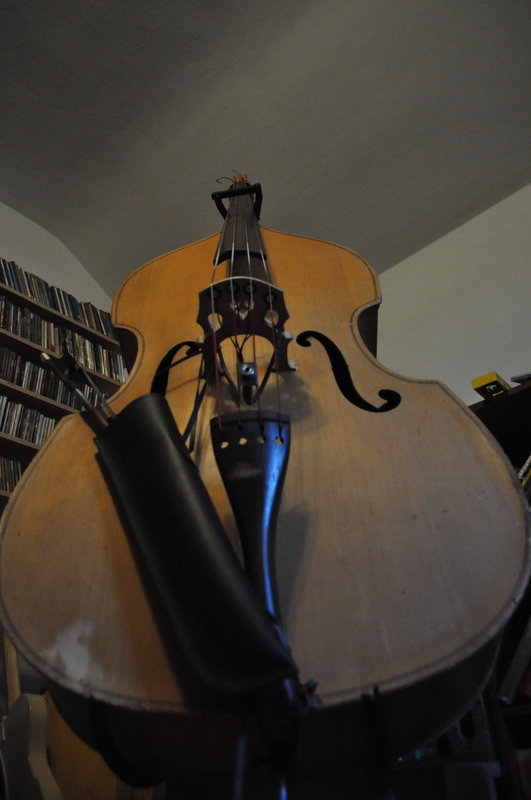 I have spent many an hour with that bass gigging and practicing. Without the Kay I would have been out of an instrument for these last 7 years. I miss Ralph- we all miss Ralph – but through his example I have seen many musicians in town carry on what they consider “what Ralph would do” for musicians and the scene here in town. He was a gem and since he has passed away I have been fortunate to become friends and play music with his children: Will, Becky, and Jody. So here is to missing you, Ralph. Should have fired me on that first gig with just how bad my technique is! From Right to Left: Ralph Sappington, Jeff Troxel, and Me. Here is a pic of the famous “Ralph’s Bass” from about 2008. I’m going to leave Ralph’s guitar here in Billings. Tony will be taking over my office on the 3rd floor of Losekamp, and it’ll be there any time someone needs a guitar. That’s the best way to honor Ralph’s memory and his generosity. I most certainly agree! Thanks Sam! You will be missed also!